RAWAI, PHUKET: Plans are afoot to expand an artificial reef off the coast of Koh Racha Yai Island, south of Phuket. Paitoon Panchaiyaphum, director of the Phuket-based southern regional office of the Marine and Coastal Resources Conservation Department (MCRCD), said the artificial reef had been a great success since its construction three years ago. 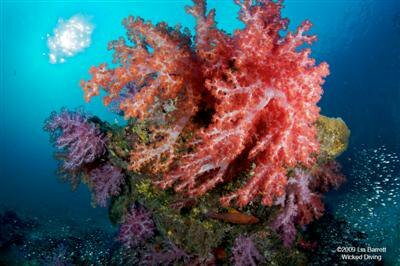 “Our research shows lots of marine animals have already made the reef their home,” he said. “More and more tourists are coming to the island to dive, around 300 each year on more than 20 diving boats,” he added. The artificial reef currently comprises 300 concrete modules. The office is planning to ask the Ministry of Natural Resources and Environment for a budget of 22 million baht to sink 3,000 more modules, expanding the reef structure tenfold. The MCRCD also hopes to sink two boats donated by the The Racha resort on Koh Racha Yai. The office is looking for private investors to provide a 300,000 budget to sink the vessels. “We’re holding a meeting with some investors on Monday and are asking for donations to help us lower the two boats to the ocean floor,” Mr Paitoon said. The MCRCD hopes the expanded reef will attract an additional 4,000 tourists annually and generate 100 million baht for Phuket, Mr Paitoon said. “We’re hoping to get budget approval within two months,” he said.